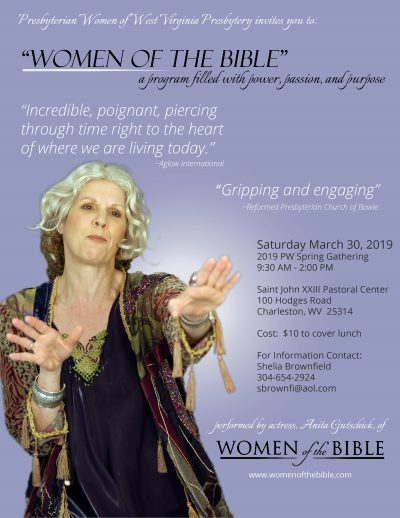 The Presbyterian Women of the Presbytery of West Virginia will hold their annual PW Gathering on March 30, 2019 at Saint John XXIII in Charleston from 9 a.m. to 2:30 p.m. The Keynote Speaker will be Anita Gutschick, a national speaker and actress who portrays women of the Bible to inspire and breathe life into ancient voices. Women of the Bible is a dramatic, one-woman presentation that brings the Bible to life in ways that offer lessons for the present and hope for the future. Gutschick developed Women of the Bible in 1995, and it has become her most passionate vocation. She uses the sacred text as an outline rather than a script and challenges her audience to look deep within themselves and see how faith can strengthen their lives and relationships. Her unparalleled artistry, along with disarming wit and candor, result in powerful, intimate portrayals laced with soul-searching, interactive questions that keep audiences spellbound from start to finish. All Presbyterian Women of the Presbytery of West Virginia and their lady friends are invited to attend this dynamic gathering designed just for them. There will be a short business meeting, followed by celebrating the Lord’s Super together. The Gathering will also provide a wonderful opportunity to meet and fellowship with each other and God. Price is $10 per person to cover the cost of lunch. Reservations must be made by March 18. The Registrar for this event is Joanne Yingling. Checks should be made to PW of WV and sent to her at 6105 Clark Drive, Huntington, WV 25705. Additionally, lodging is available at Saint John XXIII on Friday night. Cost is $42 per person for a double room or $52 per person for a single. Room reservations should be made to Joanne Yingling at the time of event registration, with checks also made to PW of WV. Call Joanne at 304-633-6696 or PW of WV Moderator Shelia Brownfield at 304-654-2924 with questions.